On the 17th and 18th of December 2011, I made a trip back to Malaysia just for the most epic annual comic festival that I’ve been faithfully attending for the past 9 years: Comic Fiesta. It was held at the Kuala Lumpur Convention Center Exhibition Halls 4 and 5, the largest event space it has ever taken up in its 10-year run. Despite some glitches with crowd control on Day 1 which I will not go into, I found myself enjoying this year’s event the most out of all my previous experiences, which I must credit the event organizers and the legendary booth owner tag (which basically allows its bearer easy access into and out of the event halls). In any case, the purpose of this post is not to review the event itself (even though I would love to), but the marvellous swag that I managed to procure. Year after year of attending Comic Fiesta I realized that many people do not take the time to type up their thoughts on the stuff they’ve bought, which I am partly guilty of myself, so I decided that I would do it all to completion this year, so matter how tedious the task might seem. 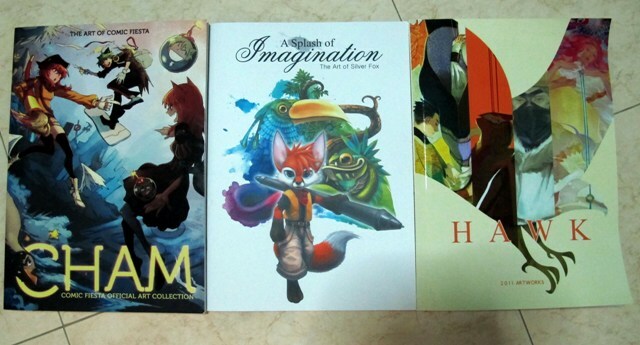 In this first part, I will be reviewing the 3 artbooks I purchased: CHAM (the official Comic Fiesta Art Collection), A Splash of Imagination: The Art of Silver Fox, and Hawk. Loot Review Part 1 is a go!